Becoming your authentic self seems to be the work of a lifetime. Every once an a while someone comes along to speed up that process. Brené Brown researches shame, fear and vulnerability, so she has a lot to say about authentic living. 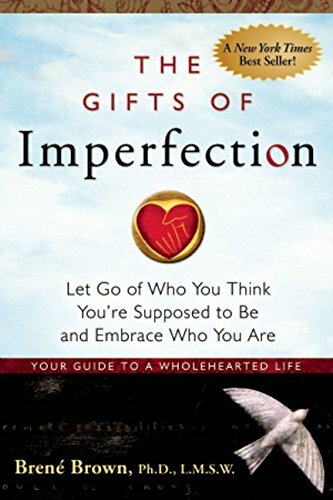 That is the focus of her book, The Gifts of Imperfection. This is not a book review (I haven’t had to do one of those since college and would like to keep it that way), but a small collection of takeaways and personal reflections. If I could sum this book up I’d say Brown’s advice boils down to this; you’re screwed up. So am I. Let's just go with it. And that’s worth the price of admission if you can really absorb it. Beyond accepting my imperfections, Brené Brown wants me to know that there are actually gifts hidden inside of them. I’m listening. Brown sets out an authentic path called Wholehearted Living. Living with your whole heart. Accepting your whole self. Not living in shame. It’s a liberating message, especially in a time when so many of us are looking through the tiny, cutting eye holes of our own cheap masks. Masks like career ‘identity'. Masks like the self we project into social media. Masks like our 'blogging voice'. Brown lays out the gifts of imperfection as courage, compassion and connection. These are the bounty that embracing our flaws will bring to us and to those around us. I am particularly drawn to Brown’s definition of connection as, “the energy that exists between people when they feel seen, heard and valued; when they can give and receive without judgement; and when they derive sustenance and strength from the relationship.” (p.19). Painful. Flawed. Unworthy. For such hefty topics, Brown offers a surprisingly light read. This lightness comes with the admission that no book can solve such deep rooted issues. These deep cuts heal with time, throughout a lifelong journey towards wholeness. I am almost certain, as an artist or creative, you resonate these definitions of connection and shame. If the journey towards healing is one you’d like to take, I think you’ll find value in this little guidebook. You will also discover what Brené Brown and myself have both discovered; that the search for worth and belonging leads beyond the self, towards faith, hope and love. Brown’s faith remains ambiguous throughout these pages, and perhaps that’s intentional to appeal to as broad an audience as possible. I do have some issues with such vague spirituality touched on, as if a ‘spiritual feeling’ or belief in a higher power were enough, outside the concept of relationship with a loving Creator. I believe that relationship is the greatest source of freedom from soul-crushing shame and fear. Brown might agree with me, or she may not, but the fact that she doesn’t offer even that amount of clarity about spirituality – something that in her own writing is a key to wholehearted living - is unfulfilling for me. Spiritual depth or not, there is plenty to like and to learn from in here. The power of acceptance. Joy. Gratitude. Faith. ‘Letting go of scarcity’. Ebracing play. Rest. Calm. Stillness. Amen, sister. Grab a copy, give yourself a day off and read it on the beach. Whether by book or sunshine or some other alchemy, I’m willing to bet you’ll come back a little more your self.